I was really intrigued by this book when I saw it on Netgalley, and I knew I had to request it. Unfortunately, it was just okay for me, and I didn’t like it as much as I wanted to. I had a really hard time getting into it, especially at the beginning. It was about a quarter of the way in that I started to like the story a little more. The dual POV didn’t work for me, and it was hard to tell who was narrating because Rhen and Harper’s chapters were really similar, and they sounded pretty much the same to me. I could only read a few chapters at a time before needing to put it down. I just really struggled with it. I think a lot of my struggles with A Curse So Dark And Lonely come from me being bored. I really liked the idea of a modern day re-telling where Belle ends up in a magical land to break the curse. It just took a while to get there. I couldn’t completely root for Rhen and Harper, and I felt like they had no chemistry. I had a hard time with the fact that they basically abducted girls, hoping they would be the one to break the curse. And for a while, it seemed like she would end up falling for Grey. I was surprised it didn’t go that way. Speaking of Grey, I was surprised by everything that happened with him at the end of the book. I know there’s a sequel, and while I don’t think I’ll pick it up, I am curious to see where things go for him. It’s strange, because this book read like a stand-alone, but with how things ended, there is room for more story. I wish we had more of Harper’s life before Emberfall. All we really know about her is that her mom’s dying of cancer, her dad’s not in the picture, and her brother has taken up her dad’s work because of the debt he left them in. I honestly couldn’t tell you anything else about her and her life. Still, it was interesting to see her get settled into life at Emberfall. It did get a lot more exciting at the end, and it was nice to actually have some action, as opposed to all of the traveling that happens in the book. I don’t mind a bit of traveling but I needed something to break it up a little bit. It was too bad we didn’t get more of it throughout the rest of the book. 2 stars. I liked Grey, and Harper was a really thoughtful, kind character but I really struggled to get through it. It’s a cool take on Beauty And The Beast, though. White Stag, the first book in a brutally stunning series by Kara Barbieri, involves a young girl who finds herself becoming more monster than human and must uncover dangerous truths about who she is and the place that has become her home. A Wattpad break out star with over a million reads! Now expanded, revised and available in print and eBook. When I saw this book on netgalley, I was intrigued enough to request it. The cover is beautiful but unfortunately, I didn’t like this book as much as I wanted to. One of the things I didn’t like was how bored I was. The world didn’t make a lot of sense to me, and it’s not really clear how the humans and goblins came to be. The Stag and it’s importance to the Goblin King wasn’t clear, and the hunt didn’t make a lot of sense. It’s an interesting idea, but I just needed more details. The mythology was a little odd to me. It seemed like a mix of different mythologies, which could have been cool but didn’t work because it made things more confusing than they should have been. It felt like the goblins weren’t really goblins- they felt more like faeries to me than actual goblins. The book was also pretty forgettable and even though I finished the book pretty recently, I also couldn’t tell you most of what happens in the book. It felt like a blur, and I think I kept reading in the hopes I would end up liking it more. Unfortunately, that didn’t happen, and while I can see why people really like it, I just needed more from it. I also wish I had more to say about White Stag, but I really don’t. Unless I want to start repeating myself, of course. 1 star. The cover is beautiful and I liked the premise of the book. But I was bored, and thought there needed to be more world-building. We get too little about the world, and what we do get is too confusing. I remember hearing about this book and being so excited about it. It’s an alternate London, where commoners are basically slaves for 10 years to those in power. It seemed up my alley, but I didn’t like it as much as I thought I would. And for some reason, I never got around to reviewing this book, and since I was looking forward to it, I did want to talk about it. It was really hard for me to get into, and I don’t know that I’m interested enough to keep going with the series. The origin of slave days seemed really confusing, and not explained very well. It’s the same with the origin of those with skill, and for the life of me, I cannot remember how it started. It just didn’t seem like the world was explained- you were immersed in the world, which was different, but I found myself wondering what the history was, and I hate that whatever was explained isn’t sticking. I do wonder when it’s supposed to take place- there were times when it felt like the technology was modern enough, but at the same time, it felt like an alternate Victorian London. I did like that, the alternate Victorian London feel, and now that I think about it, it is sort of a steampunk London, which worked pretty well with the concept of a slaveday. Still, I feel like this book is another book in the wave of books where the upper class has powers that the lower class doesn’t have (or isn’t supposed to have, but does). Maybe I’m just jaded about this type of book already, but for me, there are better books in this genre to read. Maybe if I had read this book before some of the other similar books out there, I would have felt differently. Or maybe it’s just not my cup of tea. Either way, it’s not for me, but maybe you’ll like it. 2 stars. For me, this one was okay, and I don’t know if I’ll be continuing the series. What It’s About: Identity Crisis. As a biracial teen, Nina is accustomed to a life of varied hues—mocha-colored skin, ringed brown hair streaked with red, a darker brother, a black father, a white mother. When her parents decide to divorce, the rainbow of Nina’s existence is reduced to a much starker reality. Shifting definitions and relationships are playing out all around her, and new boxes and lines seem to be getting drawn every day. Between the fractures within her family and the racial tensions splintering her hometown, Nina feels caught in perpetual battle. Feeling stranded in the nowhere land between racial boundaries, and struggling for personal independence and identity, Nina turns to the story of her great-great-grandmother’s escape from slavery. Is there direction in the tale of her ancestor? Can Nina build her own compass when landmarks from her childhood stop guiding the way? Rating/Review: 2 stars. It was okay for me, and I wanted to like it, but I had a hard time with it. I found myself skimming through the part where she’s reading about her relative. I liked the present-day story a little bit more, and the message was really obvious- but it’s also really important. She really does struggle to fit in, and you see how much things change her and how she feels caught in the middle on so many different levels. I did really like seeing the relationship with one of her friends and her reaction to Nina hanging out with other people. I think it’s something we can all relate to, feeling like we don’t fit in, but I feel like I understand Nina a little better. What It’s About: Nikki Grimes, a bestselling author known for titles such as Dark Sons, Barak Obama: Son of Promise, Child of Hope, and Voices of Christmas has written a gripping book from the perspective of a girl named Mister (Mary Rudine) who finds herself momentarily distracted from her faith commitment to purity by a handsome boy named Trey. After one night of weakness, Mister finds her entire life has changed, even if she can’t yet accept all the changes occurring within her are real. When the emotional scars of losing her innocence are more lasting than she imagined, Mister turns to a book of her mother’s, which contains poems from Mary’s perspective. As both Mister and Mary’s voices play out in the story, a full and meaningful portrait of Christian faith, trust, and forgiveness emerges, along with the truth that God can use even the most unplanned events in our lives for his greater glory. Rating & Review: 2 stars. This one was okay for me. It was a quick read, which I think is because the entire book is told in verse. It was okay, but sometimes it felt like things were broken up to give the appearance of poetry, because there were times where it didn’t feel like I was reading poetry. Then again, I don’t read a lot of novels told in verse, so maybe unfamiliarity is where my problem lies. There is a whole diary feel to the book that didn’t quite work for me. The comparison to Mary, Jesus’ mother, did not work for me at all, and I felt like the comparison was trying to compare apples and oranges. I’m also not sure what the book was going for abstinence, maybe? That’s the impression I got. I’m also not quite clear on who the book is actually meant for- definitely not me, but maybe a teen who’s questioning her faith is the target audience for this? The ending was also abrupt and left a lot of questions. The first of an epic new trilogy starring the ultimate anti-princess who does not have a gentle heart. Lada knows how to wield a sword, and she’ll stop at nothing to keep herself and her brother alive. And I Darken is such a cool book! I don’t even know where to begin…this book just pulls you in, and you can’t stop reading until you’re actually done with the book! What I like the most about And I Darken is that it has an alternate history feel to it, which I think is why some people tagged it as fantasy. Even though there are no fantasy elements in And I Darken, it does have a fantasy feel to it. And who knows, it might become more of a fantasy later on in the series! It was a lot more political than I expected- not in a bad way, because you really see the politics of the time. It’s definitely based on history- Dracula is a teenage girl in this book- but I’m not completely sure how historically accurate it is. Either way, you really get a good feel for what it might have been like when Lada was alive. Speaking of Lada, she is resilient, cold and calculating. She knows what her role is in this world, and she doesn’t want to play along. And it was really interesting to see, because Lada struggles with Lada’s dislike of women and her feelings on her own femininity. Yet she comes to realize that power comes in a lot of different forms and women have their own power, though it might be different than the power that the men in their world have. Her relationship with her brother is really different than what we see in a lot of YA. Her brother, Radu, is a lot more delicate than Lada, and that both frustrates her and draws out a protectiveness she has for her brother. They are everything that the other is not, and it makes for an interesting relationship between them. We also see both Christianity and Islam explored, but it’s done in a way that’s not preachy. And we Islam presented in a way that’s not judgmental, which is really refreshing, because it easily could have gone in that direction. Instead, it’s seen as a religion in it’s own right, and it’s not seen as good or bad…it just is. There’s something very neutral about how religion is presented in this book, and I really like that. As for Mehmed: both Lada and Radu think about him a lot. He does change their lives, and we see how much he changes their relationship. I think I’m just going to leave it at that, because I’m not completely sure how I feel about Mehmed. As much as I liked this book, it did feel dense, and partly why it took me a while to get through it was because I needed to take random breaks to let everything sink in. And Lada, Radu and Mehmed seemed so young to be in the positions they were in. I really forgot that they were around 14 or 15 at the end of the book, and even though it probably wasn’t unusual for that time period, it still seems so foreign. Then again, I think a re-read is in order, because there’s so much in this book that I’m sure I’ll see some things I missed the first time around. 4 stars. I really liked it, and I love the take on Dracula! I can’t wait to read the next book. Book Review Round-Up is an ocassional feature where I do short reviews of some of the books I’ve read recently. What It’s About: When novelist Owen Quine goes missing, his wife calls in private detective Cormoran Strike. At first, Mrs. Quine just thinks her husband has gone off by himself for a few days—as he has done before—and she wants Strike to find him and bring him home. What I Thought: I really liked it! I mean, it is J.K. Rowling, and I’m not at all surprised that she writes mysteries so well. I definitely wanted to spend more time in the car listening, because I couldn’t wait to see who was behind Quine’s disappearance and eventual death. Thankfully, I was able to jump right in without having read The Cuckoo’s Calling, and I liked it enough that I’m definitely looking forward to reading the other books in the series. I did like it as an audio book (except it was such a long audio book that I really needed a break from audio books), and while Glenister is a great voice for Strike, I don’t know that I’d seek him out as a narrator. Still, if I started listening to a book he narrated, I’d still listen to the book. My Rating: 4 stars. I didn’t love it, but it’s a really good mystery! Where I Got It: I received Poison as a digital advanced copy from netgalley.com, which hasn’t influenced my review in any way. What It’s About: Since the night her mother was murdered, sixteen-year-old Rory Gray has known one truth: There are no good Seeders. Now the Seeders are withholding supplies from Rory’s region for perceived disobedience. Utilizing the Wanderer knowledge she received from her mother, Rory must journey to the Citadel through uninhabitable terrain to plead for mercy. However, the Citadel isn’t as Rory remembered. The chief plant geneticist is dying and rumors fly that the store of viable seed is dwindling. The Seeders are desperate to find a seed bank they believe Rory can locate, and they will stop at nothing to get it. What I Thought: Poison is really different than a lot of the post-apocalyptic books I’ve read. I love the idea of a seed bank being controlled, and it’s a future that I (sadly) could see happening. It’s a world so different than the one we know, and yet it’s one I can picture so clearly. Post-apocalyptic Australia is also the perfect setting for this book, and I’m really looking forward to reading the next book to see what happens next. It’s also refreshing to see a post-apocalyptic book set in a different country- I can see Australia being a popular choice, for some reason, but it works so well as a setting. It’s definitely worth checking out, even if you’re a little tired of dystopic/post-apocalyptic books. My Rating: 4 stars. It’s different and refreshing than some of the other books in the genre, and worth checking out! Teenagers at Wisconsin’s Nottawa High School are drawn deeper into a social networking site that promises to grant their every need…regardless of the consequences. Soon the site turns sinister, with simple pranks escalating to malicious crimes. The body count rises. In this chilling YA thriller, the author of the best-selling Testing trilogy examines not only the dark side of social media, but the dark side of human nature. What I Thought: Need definitely wasn’t the book I thought it would be. It seemed like it would be a lot more sinister than it really was. Part of the problem is that there are too many different perspectives, and they take away from the main person narrating. Also: what simple pranks is the summary referring to? I felt like it jumped over simple pranks, right towards malicious crimes. A social network that will give students whatever they want…as long as they do what Need tells them to do…it has the potential to be a lot more creepy and dark than what we saw in the book. Clearly, the students didn’t care what they had to do in order to get what they want. You’d hope that at least some of them would be smarter than to trust Need, but all of the characters were so shallow and flat that people died and I didn’t care. There were enough characters that I couldn’t tell them apart, and even though there’s a reason for a few different narrators, it also means it was harder to care about what actually happened to any of them. The idea behind Need was interesting but again, I didn’t care when it was actually revealed. It’s over-the-top and not in a good way. It read more like cheesy thriller than chilling. My Rating: 2 stars. Interesting premise, but it was a little over-the-top. Book Review Round-Up is a very random feature where I talk about several of the books I’ve read. Today is an advanced reader copy edition of the book review round-up! In the interest of full disclosure, I received both books as an electronic advanced reader copy (e-ARC) from netgalley.com in exchange for a fair and honest review. What It’s About: The Secrets of Yashire: Emerging From the Shadows is a young adult fantasy adventure that occurs within the framework of a young girl’s subconscious mind. The main character, Brianna, finds herself thrown into a world called Yashire where she is forced to deal with circumstances that are threatening Yashire’s existence. Against her will, she is sent on a journey to restore unconditional love back to the land while also contending with the evil force in the land, Zolan. Brianna is sent on her mission by Libban, Keeper of the Land. Along the way, Brianna travels with the mystical tiger, Angelos; a huge, whitish-tan tiger with thick black stripes who sings only the purest songs of love, and the wondrous little one-eyed bird named Abiba. During the journey, Brianna is also preparing to meet her soulmate—the one she longs to be with and the one who will bring complete healing back into her life. Together they travel through fantastic lands filled with magical creatures that could only exist in the wildest of imaginations. Through her treacherous brushes with danger and heartwarming experiences of love and acceptance, Brianna discovers many things. It is here, amidst the powers and phantasms of the mind that Brianna receives life lessons and virtues to help her. Will one of her greatest triumphs be achieved as she learns to believe in herself? For only then can she truly see all of the wondrous things that life has to offer. 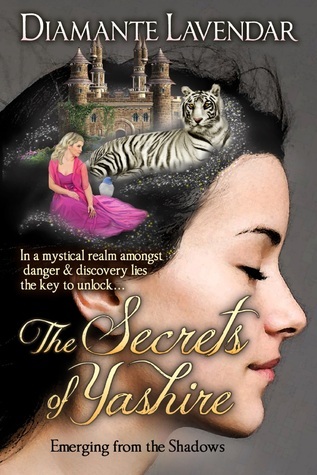 What I Thought: When I saw The Secrets Of Yashire on netgalley, I was really intrigued with it. I really like the overall premise of the book, but unfortunately, I didn’t like it as much as I wanted to. Certain things were repetitive. There were several times where you’d read something, and a paragraph or two later, you’d see the same thing almost verbatim. It does move at a really slow pace, and sometimes I wished that there was some action in it, because it seemed to drag on. There was something weird about how she reacted to everything- sometimes she seemed disinterested and other times everything was awesome. I think she was 16 or 17 and it’s labeled as YA , but she seemed a lot younger than she was supposed to do, and The Secrets Of Yashire would be better suited for a middle grade audience, I think. I don’t know if it’s necessarily bad, but I do think it could use some work. Something about it reminded me of one of my NaNoWrimo drafts. I am hesitant to say it’s bad, because I do think it has a lot of potential. A story told in the subconscious of a girl is such a cool idea, and the world seems a little bit different. I liked that patience and perseverance are really important, but everything as a whole didn’t come together for me. My Rating: 1 star. I didn’t like The Secrets Of Yashire, and it’s not my thing, but if experimental fantasy is your thing, this might be the book for you. What It’s About: Lo-Melkhiin killed three hundred girls before he came to her village, looking for a wife. When she sees the dust cloud on the horizon, she knows he has arrived. She knows he will want the loveliest girl: her sister. She vows she will not let her be next. 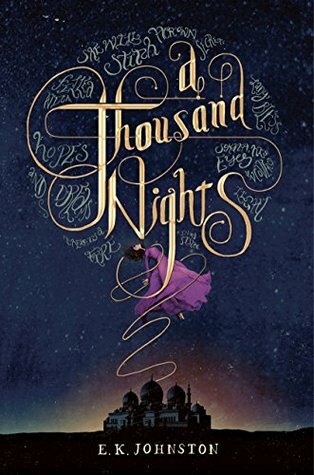 What I Thought: I was really excited about A Thousand Nights, and it was one of the books I was looking forward to reading this year. I ended up not liking it, and I feel weird about that because it seemed like a cool book. So, I have no idea what the main character’s name is. I don’t think we learn it at any point in the book, and if we do, it clearly didn’t make an impression. Really, she could have been anyone, because I feel like we learned nothing about her. The only character name I can actually remember is Lo-Melkhiin…I think he might be the only character who actually has a name because everyone is named in relation to the MC. Her sister is referred to as her sister, Lo-Melkhiin’s mom is named Lo-Melkhiin’s mother, and so on. It’s hard to remember anyone when they have no names and nothing else to distinguish them from all of the other characters. It seemed like there would be more romance, at least from the summary, so I was surprised that there wasn’t really any romance there. I did like that the MC had growing power, leading her to be the only one who can defeat the king. I do wish the magic between them was explained more because it seemed really random. There does seem to be a lot of folklore, and from what I’ve heard, it’s based on 1001 Arabian Nights. Which I haven’t read, and may be why it felt like something was missing. Or maybe it’s just me, and it doesn’t matter if you’ve read 1001 Arabian Nights. Something about this book made me think of Cruel Beauty by Rosamund Hodge- I think there’s something about the world and how the story is told that would make it a good read-alike for Cruel Beauty fans. My Rating: 2 stars. Mostly because I just didn’t care. A Thousand Nights isn’t for me, but I can see why people would like it- the writing was beautiful but not enough to get my interest. Where I Got It: I received a digital advanced copy from netgalley.com, which hasn’t influenced my review in any way. Promise! 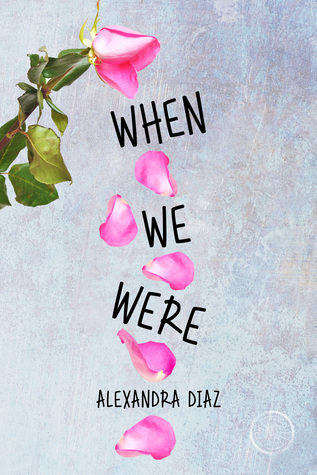 Previously published as OF ALL THE STUPID THINGS, this coming of age novel is a 2011 ALA Rainbow List Book and a 2011 New Mexico Book Award Finalist. Even after spending hours training for her marathon, down-to-earth Tara can’t outrun the rumors about the boyfriend she thought was perfect. …but that’s not possible when new-girl Riley arrives in school and changes everything. Suddenly Tara starts to feel things she’s never felt before—for anyone—while Whitney Blaire tries to convince her that this new girl is Trouble. Meanwhile, Pinkie’s world begins to crumble as she begins to suspect that the friends she depends on are not the girls she thought she knew. Can friendship survive when all the rules are broken? When We Were seemed really interesting, and yet, I found myself thinking that it was just okay. I really did want to like it more than I did. I think the biggest reason why When We Were was just okay was that I felt like it wasn’t as developed as it could have been. Like Tara, Pinkie and Whitney Blaire. I get the girls are best friends, but they’re all so different that it was a little hard to see why they were such close friends. They were all pretty stereotypical- Tara’s the athlete, Pinkie is the academic/glue of the group who has no mother, and Whitney Blaire is the mean girl who acts that way because her parents are never there. There is mention that they have a history together, but unfortunately, we don’t see that history, and I think having a little bit of history would have made their friendship a little more realistic and believable. I feel like each girl was somewhat superficial, and I wonder if it’s because we see each chapters from all three girls. We don’t really get enough time with each one for them to fully develop. Which brings me to Riley. I think, of all the characters, Riley is probably the most interesting. She had a little bit more to her than the other characters did, and I wish we saw more of her. I didn’t get Whitney Blaire’s instant dislike of her, which was for no apparent reason. Later on, I could understand her dislike of Riley, because Whitney Blaire has some abandonment issues, and feels threatened by how close Riley and Tara become. Initially, though? There’s no reason for it. As much as I liked Riley and wanted to see more of her, I also felt like her relationship with Tara was sort of random and out of nowhere. I think, because only a third of the book is from Tara’s perspective, we don’t see Tara really explore her feelings for Riley- all of a sudden, they’re making out. The reactions from Whitney Blaire and Pinkie (especially Pinkie) were weird and frustrating. I really need to back-track for a second- there are rumours that Tara’s boyfriend Brent was seen making out with one of the guy cheerleaders, which leads to Tara breaking up with him, and Brent denying it. This is then ignored for most of the book, until we learn that it wasn’t actually true. Really, for the lack of attention it received, and the way it was dropped, she could have broken up with up with him for any reason. I think I was just expecting it to be more of a thing. Back to Whitney Blaire and Pinkie. I get Whitney Blaire thinks Tara is believing Riley over her, but saying that Riley and Tara are dating simply because Tara believes Riley over Whitney Blaire was weird, confusing and out of nowhere. It made no sense to me. I felt that way with Pinkie, a little, but with Pinkie, it was more frustrating than anything else. Pinkie is convinced that Tara can’t be interested in girls because she dated Brent and because she’s too pretty. In particular, when Pinkie says that she has no problem with gay people but doesn’t want them near her…I was horrified by that, especially from someone who seems caring. Honestly, it sounds more like a Whitney Blaire comment than a Pinkie comment, at least from what we see in the book, and it’s just so cruel and hard to believe that she would say it, because until that point, she’s the last person I’d expect it from. But their reaction to it was overall believable, in the sense that I can actually see people reacting that way. Her mom was pretty awesome, though, in how she reacted. Yes, the mom was surprised, but she was so accepting of Tara. Even though it seems like it would be an adjustment for her, Tara’s happiness is so important to her, and I loved that. Even though there are a lot of things I didn’t like or thought were weird (with one or two things I did like), When We Were did keep me intrigued, and I really wanted to see what would happen with the characters. 2 stars. When We Were isn’t my cup of tea, but something about it did keep me interested enough to see what would happen. Where I Got It: I received a digital review copy from netgalley.com in exchange for a fair and honest review. Promise! I was hoping I would like Avalon Rising, but I didn’t. I thought the first book (Camelot Burning) was okay, but I was interested enough in the world that I thought I’d give Avalon Rising a try. One of my biggest issues with Camelot was the fact that I didn’t feel like the world or the characters were described, so I had the hardest time picturing everything and getting a good feel for a steampunk Camelot. Unfortunately, that is something that continues with Avalon. I just don’t know if steampunk (which is normally associated with the Victorian era) works with Camelot and King Arthur. I mean, there’s Avalon and a quest for the Holy Grail, but there are so few details about this Camelot that it could just as easily be set in a different time period. Maybe steampunk is too associated with the Victorian era for me to really see it written in any other time period. I also didn’t get why Jersulem and the Spanish Rogues kept coming up. I do admit that I should have read Camelot Burning before, and maybe that’s why it was confusing. I’m also not familiar with a lot of the stories surrounding King Arthur, so it could be that. At any rate, it wasn’t clear why those things are so important. 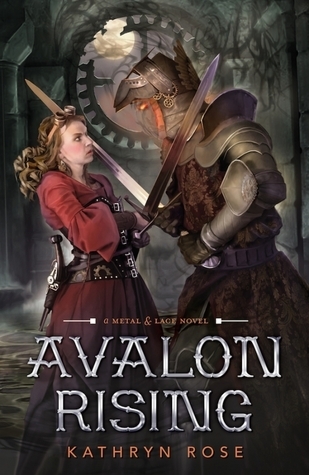 There is something about Avalon Rising that feels very cold and distant to me, and it felt like the characters were there, doing things I can’t remember. I feel so bad about saying that, because I know a lot of work goes into writing a novel, but this series just isn’t working for me, and coming to life the way I’d want it to. 1 star. I couldn’t get into it, and it is a shame, because the idea of a steampunk Camelot is really promising. I just don’t think this is the series for me. Source/Format: I got the e-book from netgalley.com, which hasn’t influenced my review in any way. Promise! When—after a heated argument—Maddy and Ella get into a tragic accident that leaves her sister dead, Ella wakes up in the hospital surrounded by loved ones who believe she is Maddy. Feeling responsible for Maddy’s death and everyone’s grief, Ella makes a split-second decision to pretend to be Maddy. Soon, Ella realizes that Maddy’s life was full of secrets. Caught in a web of lies, Ella is faced with two options—confess her deception or live her sister’s life. I have such mixed feelings about this book! So much of it made me angry, and I was expecting more mysteries and lies than what we really got, and yet it’s an interesting premise. The characters made me so angry! I understand why Ella did what she did, and I totally get how she feels, and why she feels that way. I understand that she really felt like she was living in Maddy’s shadow, and that it would be easier for her to pretend to be Maddy since everyone has so happy she survived. But I was also angry that it went on for so long, and that no one else seemed to notice. I know that grief makes people do very strange things, and everyone around her was too wrapped up in their grief to notice that Ella was alive, and not Maddy, but still, how do you not figure out who’s who? And how does Alex not figure out that it’s Ella and not Maddy? Considering he was Maddy’s boyfriend, you’d think he’d figure it out. Plus, his whole “Maddy needs to start acting like herself right way, or else” thing was so frustrating and hard to read. Of course, she’s acting differently, not only did her identical twin JUST DIE, but she’s also pretending to be her dead twin. I really am trying to chalk it up to everyone’s grieving but it’s so hard! And no one seems to care that she was pretending to be her twin. Maybe they gave her a free pass, but I wanted more fall-out after the big reveal that it was Ella. I also wanted to see more of what happened after, instead of the jump to Ella starting over at college. Ella was just really frustrating as a character- unhappy because everyone is glad that Maddy’s alive and feeling like she needs to pretend to be Maddy, and yet she keeps everyone at arm’s length while judging them and acts like she doesn’t care when she really does. I also felt like the mystery was really blah. It’s your typical mean girl mystery, and I was expecting something…more. Something darker. I didn’t really care about the lies and secrets Maddy had. Granted, it was a pretty crappy thing to do, but it was still really unimpressive to me, and wasn’t what I expected at all. I know the book deals with the fact that they grew apart, but I felt like that could have been dealt with in a much different way. 2 stars. 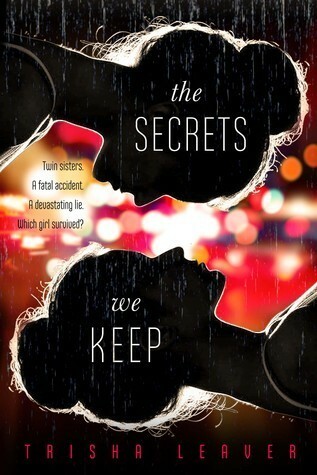 I liked the premise but wished that Maddy’s secrets were darker instead of something out of Mean Girls. And Ella was so frustrating that I couldn’t sympathize with her, even though I do understand why she acted the way she did. I just couldn’t suspend any disbelief for this one.